This gorgeous apartment covers an area of 30m2 and is perfectly located for visiting some of the citys most stunning sights. 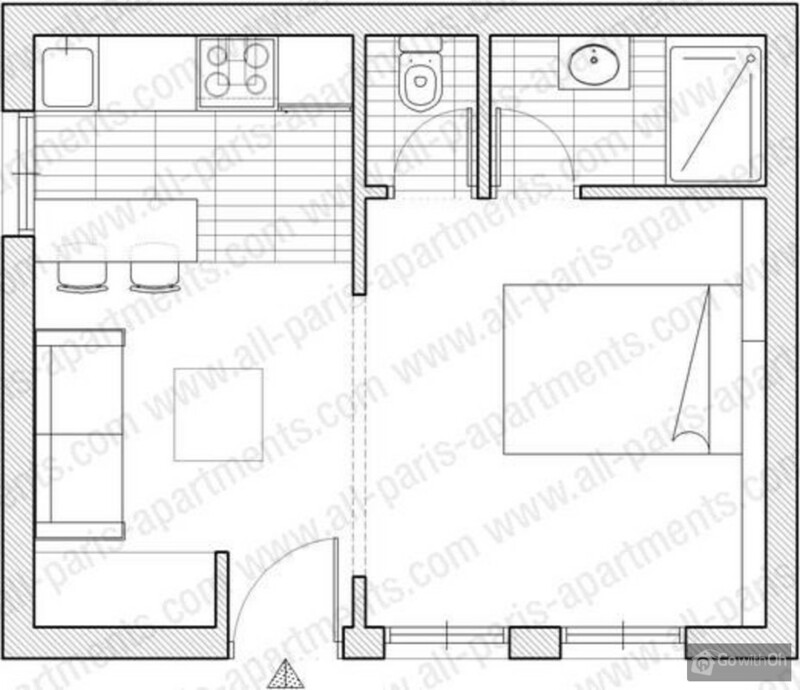 The apartment is situated on the first floor of a building (without a lift) that is typical of the French capital. Perfect for solo travellers or a couple, this apartment consists of a lovely living room with a sofa-bed, a fully-equipped open plan kitchen, a bedroom with a double bed and a bathroom with a shower. The toilet is located separately. Let yourself fall in love with the peace and quiet of this apartment which looks out onto a courtyard and which features exposed stone walls. You will also have a full range of technology at your disposal, including a flat-screen television and a Wi-Fi internet connection (connection also available by cable). Thanks to the apartments fantastic location, getting around will be quick and easy. The Les Halles and Louvre-Rivoli metro stations are located close to the apartment and will provide you with access to metro lines 5 and 14 and three RER local train lines, letting you reach almost any part of the city as well as the Roissy, Charles de Gualle and Orly airports. You will have no problems finding a wide range of shops, terraces, cafes and restaurants in the surrounding area where you can enjoy a slice of genuine Parisian life. The prestigious location and the level of comfort make this the perfect option for a romantic stay. Check-in between 15:00 and 20:00. Late check-in after 20:00 available for a supplement of 30. Check-out between 08:00 and 11:00. Early check-out before 08:00 available for a supplement of 30. Fan on request (subject to avaibility). 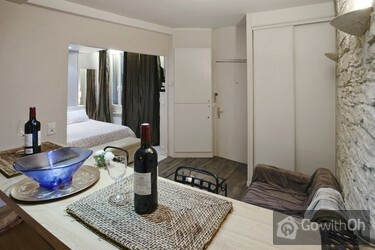 Abcense of airconditioning was noticeable; however, overall it was a usual apartment you can expect in Paris. M. - manager - was responcive and flexible. PLUS 1.Good position for visiting downtown 2.Flat description in main lines OK 3.WiFi MINUS 1.Old house; stairs shaky; cables hanging down from the ceiling 2.Flat floor has about 10 degrees slope 3. The contact person did not read our email on arrival. We lost half day 4.Payment in cash. ...5.Neither fix nor mobile phone working. No way to make emergency call for ambulance or police 6.In the case of fire people living in the flat are in a trap. There is neither door nor window to escape CONCLUSION: Taking into account flat, its environment and security aspects, the flat is far below any Europen civilized standards. Knowing what I know today, I would never rent this apartment. Dear Client, we thank you for your comments. The property owner will take all necessary measures to ensure a good availability and communication with the clients via email as well as a service of quality, by providing information such as emergency telephone numbers in the apartment. Furthermore, we confirm that the payment method is indicated on both the webpage and the confirmation email. 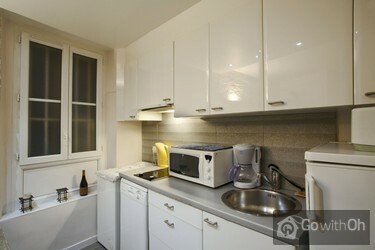 Excellent location, close to the Louvre, train/metro, lots of restaurants and a boulangerie that is out of this world! Short stoll to the Seine, Velib stand nearby too. Apartment was well equipped, clean and comfortable. Nice & quiet at night for sound sleep. 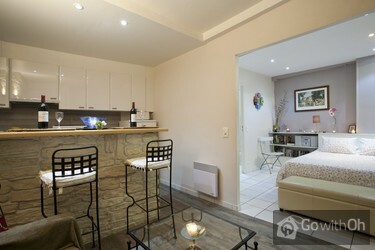 Appartement propre, bien équipé, très bien situé, à proximité de nombreux restaurants et commerces. Son emplacement au premier étage joue en sa défaveur lors des passages des résidents la nuit. Les toilettes sont de type broyeur SFA et nécessitent une attention particulière (les frais de... débouchage sont à la charge du locataire, retenue de la caution). L'appartement est très sombre et nécessite que l'éclairage artificiel soit en permanence allumé. Les fenêtres donnent sur une cour intérieure. Le solde de la location est payable uniquement en liquide. Un virement de l'intégralité du séjour peut être effectué avant l'entrée dans les lieux. La propriétaire refuse les virements dès la réception des clés malgré la possibilité d'effectuer le transfert via internet disponible sur place. Estudio muy confortable,muy limpio é higiénico. La persona encargada de recibir muy cordial, atenta y puntual. El pequeño problemita es que lla señal de teléfono movil no ingresa al departamento. This apartment is just fantastic for people who want to do their own thing. 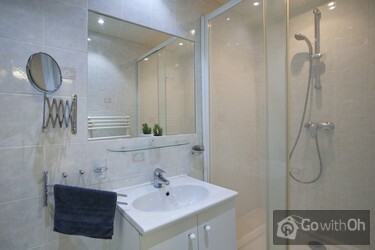 The location is superb, close to Metro, restaurants; yet quiet as!! The checkin and checkout worked brilliantly. 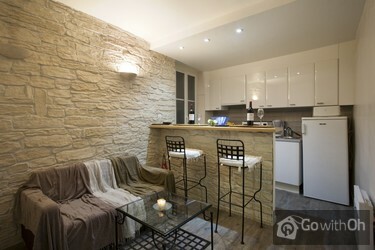 Our time in Paris was enhanced by this wonderful apartment, clean, tidy, well resourced and excellent value for money. Just a pity we couldn't stay forever! 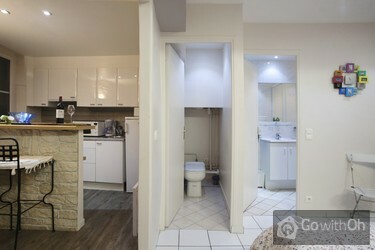 This is an extremely well situated apartment right in the centre of Paris. The accommodation was small but comfortable with the exception of lumpy pillows on the bed. It was well equipped with fridge, cooktop, microwave, washing machine, WIFI, and cable TV, but we could have used an air conditioner ...to avoid leaving the windows open all night, which made things noisy - this could be a real issue in the height of summer. The building was old and not well presented from the streetscape, but it had some charm for all that. All in all we enjoyed our stay and would be happy to do it again. La posizione era perfetta per le mie esigenze purtroppo l'appartamento è minuscolo sporco e malmesso. Un solo armadio con le ante rotte ed i ripiani sporchi, il soffitto del bagno pieno di macchie gialle, così come le lenzuola. Strani schizzi da sopra il water quando si scarica e la manager che si... è presentata 3 ore prima del nostro appuntamento senza preavviso e l'abbiamo dovuta far entrare mentre uno di noi ancora dormiva Perchè diceva di dover prendere qualcosa da un cassetto. Gentile Cliente, La ringraziamo per la sua recensione. La informiamo che sul sito, nella descrizione dellappartamento, vengono indicate le dimensioni dello stesso in mq. Le confermiamo inoltre che il proprietario che controllato lo stato dellappartamento e della biancheria dei letti per assicurarne la qualità. Approfittiamo per ricordarle che lora limite per lasciare lappartamento (check-out) è alle 11, e sebbene non sia necessario pulire a fondo lappartamento prima di partire, si richiede comunque di lasciarlo in buone condizioni. Great location. All what we needed in the apartment. Owner greeted us on arrival and very prompt on departure. Loved the apartment - everything you need and more. I our contact in Paris was efficient even with our "traffic issues - read strikes slow trains etc that delayed us - she was so helpful and gave us a lot of good Paris info.The apartment is in a fantastic location not even 500m to the Louvre and so ...close to eveything - after using the metro for the first few days we chose to walk - there are so many great restaurants etc nearby - Must go to La Garde Robe wine bar across the road - amazing!! Only thing I would suggest - take a pillow! Paris pillows are NOT the same as Australian pillows (or I think most of the rest of the world!) and real pillows in Paris are expensive to buy. couldn't fault the rest of the apartment - so much better than any hotel - room to move and relax Both N and I were quick to help, I on our late arrival still met us and was so lovely - and on checkout she helped us out again. Apartment could not have been better in terms of a central location. Small but efficiently laid out. All necessary services( grocery store, vegetable market bakery, various restaurants) close at hand. Apartment was reasonable quite although noise from the stair well was evident. Dishwasher and ...phone were not operational. Dish washing was an issue as there was no stopper for the sink. Apartment was a little stuffy but good air flow when windows were open. Not sure what it would be like in the middle of summer.Water was extremely hot. Possible to burn yourself in the shower if not careful. Wir hatten 4 tolle Nächte in Paris. Das Apartment hat eine super Lage und ist trotzdem sehr ruhig, alles war perfekt organisiert und wir konnten am letzten Tag sogar bis 16 Uhr bleiben. Cher Client, Léquipe dOh vous remercie pour vos commentaires. La propriétaire confirme quil y a un détecteur de fumée dans lentrée. Very small apartment, but what we expected. Comfortable and adequate, but more importantly, an absolutely wonderful location. 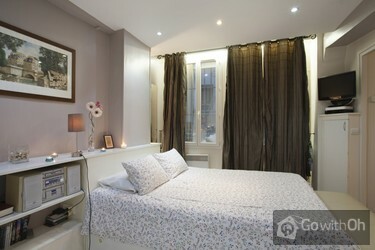 1 1/2 blocks from the Louvre, 2 blocks from the Seine, and a block from a metro station. As it turns out, the best restaurant we experienced in Paris was just across the ...street, along with a wonderful wine bar. Could not imagine a better location at a better price.The owner and his representative were very easy to deal with. We asked about staying a few hours past checkout (we had a late-afternoon flight) and there was no hesitation in allowing us to stay into the afternoon. Very nice people. It's a great neighbothood and we enjoyed the location and how close things were but, there are very loud neighbors. The Apartment is run down and easily over priced. Authentic Parisian is one thing but broken tiles in the bathroom, a washing machine that overflows into the bathroom, and a rock ...hard mattress weren't expected. Ilona was very nice, but we wouldn't stay here again. Great location, but the apartment could use some serious love. The apartment is small, but the location is excellent! You can walk anywhere from there and is so close to the Louvre. Great. Ilona was very accommodating with our check in and check out timings. She even allowed us to leave our bags in the apartment as we decided to extend our trip in Paris for a couple more hours. The location of the apartment was pretty good for us. 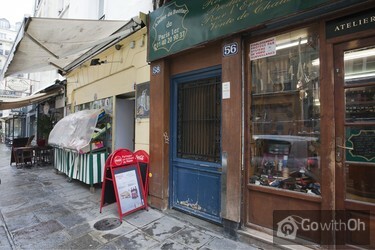 About a 15-20 minutes walk to st honore for shopping. ...Ilona also recommended a really great place to have dinner at on our first day as we were tired and missed our reservation. The apartment has no lift and is located on the 2nd level (after 2-3 flights of stairs). It is also equipped with a washing machine and a hairdryer. Heating works perfectly fine. entrada departamento falta un descanso donde pararse bien sin riesgo; resultaba incómodo para entrar. Nos entregaron una sola llave lo cual nos condicionaba a estar pendioente de ella en todo momento. Estimado cliente, agradecemos y valoramos sus comentarios. El propietario confirma que se trata de un apartamento con capacidad para 2 personas y se entrega una única llave a los clientes. 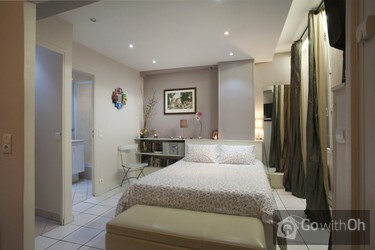 Very comfortable and we'll appointed apartment right in the centre of Paris. Lots of bars, cafes, restaurants, shops, boulangeries etc. within easy walking distance. Neighbours within the building can sometimes be a little noisy and the apartment can only get a certain amount of natural light, but ...overall an excellent apartment in good condition and one which I would definitely recommend. Checking in and out was easy and the owner was very helpful. Contacting owner and checking in was easy.